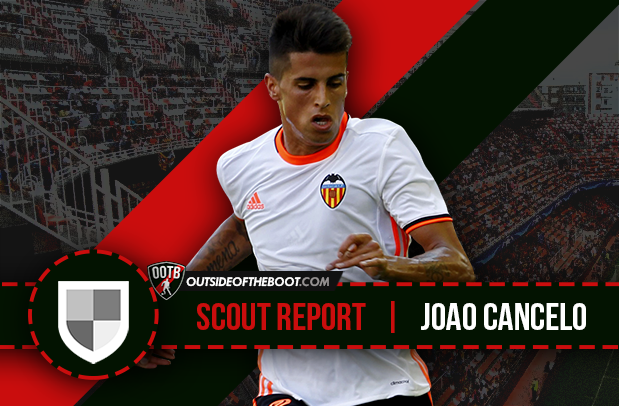 Mateus Carvalho writes a detailed scout report about João Cancelo, Valencia’s forward thinking right-back. Throughout the years it has been fairly easy to point out undisputed world class players for every position in the pitch. Naturally, this select lot evolves and mutates with time, with new talents and good players affirming themselves as worldwide sensations. Although this process is inevitable, it tends to be gradual. But what we are witnessing, in my opinion, with right backs (and left backs if I might add) is a sudden lack of world-acknowledged and praised players, who deserve the statute of legends, with the downfall of Maicon, the shift of Sergio Ramos to the centre of the defence and the end of Zambrotta’s, Philip Lahm’s or Javier Zanetti’s careers (just to state a few) only Dani Alves remaining in the above mentioned lot. There is, nonetheless, a whole group of right backs who have already proven their talents and consistency and start to “fight” for the same eternal recognition only a few players are granted by football fans of all ages and places. We can talk about, for that matter, of Antonio Valencia, Cédric Soares, Bellerín, Sidibé or Carvajal. This article aims to present another right back that, I reckon, could very well join the group of legendary right backs in the making: João Cancelo. The Portuguese right back was born in Barreiro, on the 27th May 1994, starting to play football for his local club, Barreirense. Soon enough, he drew the attention of many first and second tier clubs’ scouts and proposals started to arrive to Barreirense. Benfica beat the rest of the competition in what was described as a “tough negotiation” by the youth director of the Lisbon eagles, surely constituting a promising sign to the talent of the Portuguese youngster. Arriving at Benfica as a 14-year old, João Cancelo made his way up through all the youth levels of the academy, as he showed the maturity and progression that distinguished him from his fellow teammates. Already at the time, Cancelo showed a tactical versatility which would be one of his main features as a professional player (more on that later), displaying the same amount of competence as a right back or a right winger. All factors considered it was with little surprise that he started to train with Benfica’s senior side at the age of 18, playing for Benfica’s reserves in the Portuguese second-tier. The next season Cancelo continued to train and play between Benfica and Benfica B, continuing to display promising signs and a trademark regularity (for example he is one of the players with most appearances in Portugal’s youth teams, with 62 games for all youth Portuguese sides) that led ultimately to his debut for Benfica’s professional team under Jorge Jesus. He played only two games (one starting in the line-up against FC Porto), but leaving the impression he was being prepared to assume a regular spot in Benfica’s line-up for years to come, as Maxi Pereira, the longtime holder of that position was resisting to renew his contract. However, nobody expected the outcome of the summer transfer market of 2014, as the Portuguese starlet was loaned to Valencia, in a surprising movement that left Benfica short of another home-made talent. As for Cancelo, the first season at La Liga was a crucial one to his development. Being only 20 years old he fought for a spot with Barragán in the starting line-up and although the Spaniard gained the preference of Nuno Espirito Santo, João Cancelo collected a fair number of appearances and, most important of all, developed his style of play at a competitive level much more demanding than the Portuguese second-tier. As he himself said, the first season with Valencia was by far the one when he most evolved as a player, learning a great deal of tactical and positional aspects under the orders of Nuno Espirito Santo. Even if we was not a starter for Valencia, Cancelo convinced the Spanish club’s directors to purchase him for an astounding fee of 15 million euros given the age and little experience of the Portuguese youngster. This sign of confidence in Cancelo’s capabilities was not proven wrong as in the last two seasons, even with collectively poor performances of his team, the defender managed to establish himself as one of the best right backs in La Liga. 2015/16 was definitely his best season, as he gained a starter spot with all three coaches Valencia had that season (Espirito Santo, Gary Neville and Pako Ayestarán), displaying competence whether as a defender or as a winger (he made a signature performance against Barcelona in that position with Gary Neville on the bench). The last season was not that bright for Cancelo, influenced by the horrific campaign of the Spanish club who surprisingly fought against relegation all season. Some poor performances and conflicts with the supporters stained Cancelo’s season, which ended with his national senior debut (in only 5 caps he scored an impressive amount of 3 goals) and a presence in the European U-21 Championships, playing all the minutes of Portugal’s presence in the tournament. João Cancelo does not shy away from being a modern, offensive right back as contemporary football, mainly in dominating sides, requires. His goal-ratio at Portugal’s national team or his ability to perform as a right winger show just that. And his attributes certainly favour this style of play. For starters, he shows outstanding pace, as anyone will certainly realize instantly on seeing him play. He shows good technical qualities and impressive agility. All of this contributes to his quick and swift style whether with or without the ball. His sprints with the ball down the side of the pitch delight any football fan. Instead of revealing technical virtuosity or an outstanding dribbling aptitude, Cancelo benefits from great ability in shifting direction and speed and a remarkable ball control to impose his style of play, which favours 1-2 combinations with wingers or center midfielders and a almost natural tendency to search the end line to put crosses in the area, revealing great capacity in those movements as well. The way he uses his characteristics as a defender is definitely influenced by the style patented by Benfica’s academy. The Portuguese club favours potent and vertical football, instilling these commandments in their youngsters from an early stage of their evolution, developing their composure, speed and offensive mentality, as we can observe in the likes of Cancelo, but also Renato Sanches or Gonçalo Guedes. This straightforward mentality is not very usual in today’s football, but is most certainly present in Cancelo’s style of play. Taking all the previously stated into account there is no doubt that a purely offensive right back will be an incompetent and incomplete one. The Portuguese defender has his defensive merits as well. He displays a generous tackling capacity and a physical structure (standing at 1,82 metres) that differentiates him from other right backs. His pace and composure that favour him offensively also benefit him in the defensive process, mainly in transitions. Cancelo’s main weakness must be his concentration, which becomes the most visible in his defensive performance, not in attack-defence transitions but in a more positional sense of the concept (when resting deep near his goalkeeper waiting from the opposite side to attack). This constitutes a clear handicap, mostly because of his natural abilities in terms of tackling and composure that we have discussed above. It is not a question of basic qualities that he needs to improve or acquire, but instead a constant predisposition to use them regularly and without negative intervals that might compromise his contribution to his side. It will be crucial for the Portuguese full-back to improve his positioning and tactical grasp of every defensive nuance that his position entails. The Valencia starlet certainly has developed some of his frailties in his La Liga experience, but still has some work to do in order to affirm himself as a reliable defender. In spite of this, I have to recognize João Cancelo does not reveal many weaknesses and has the full potential to join the lot of right backs capable of making football history. It is just a matter of using his attributes and all he has learned since Benfica to further become a defender not just of offensive prowess but of defensive stability as well.